It is a joy to see you here numerous, 90 years after the birth of your association. Maria Motta, a blind but courageous woman, born in Argentina in the beautiful city of Rosario, when she returned to Italy with her parents, dedicated herself to teaching, with human and Christian passion, but not enough: in 1928, she gave birth to a spiritual community among the blind - already active in France - on the model of the Apostolate of Prayer. From that small seed developed an association that has spread throughout the Italian territory and was approved by Pope John XXIII. In a prophetic way, your founder thought of putting together the blind of her time, so that they could meet and support each other. The presence of the sighted, from the early years, gradually strengthened the movement, so that it did not fall back on itself and on the problems related to the lack of sight. Maria Motta wanted to form autonomous people capable of bearing witness to the faith through her own disability. Today all this is evident. You are strongly united, blind and blind, united by a single journey of sharing and promoting the person with disabilities, not only because it is foreseen by your statutes, but above all for the natural Christian friendship that characterizes your paths of faith. I reiterate that the best response to offer to our society, which sometimes tends to marginalize people with disabilities, is "the" weapon "of love, not the false, saccharine and pietistic one, but that true, concrete and respectful. To the extent that we are welcomed and loved, included in the community and accompanied to look to the future with confidence, the true path of life develops and experience of lasting happiness is experienced "(Address to the Convention on Catechesis and Persons with Disabilities, 21 October 2017). It is a source of joy for the ecclesial community to know that you, even today, as true missionary disciples of the Gospel, are open to the needs of the poorest and most suffering in the world. Instead of falling back on yourself and on the same disability, you courageously responded to Jesus' invitation: "I was hungry and you gave me food, [...] I was naked and you dressed me, I was ill and you came to visit me" ( see Mt 25: 35-36). Ever since Pope St. Paul VI published the historical encyclical Populorum progressio, the MAC responded positively, and you today also remember the fifty years of cooperation with the poor countries of the South of the world, where the blind are more numerous and live in conditions still very difficult. The journey of these ninety years has enabled the Blessed Apostolic Movement to better understand what the specific charism entrusted to it in the Church is, a charism that is essentially composed of two elements. 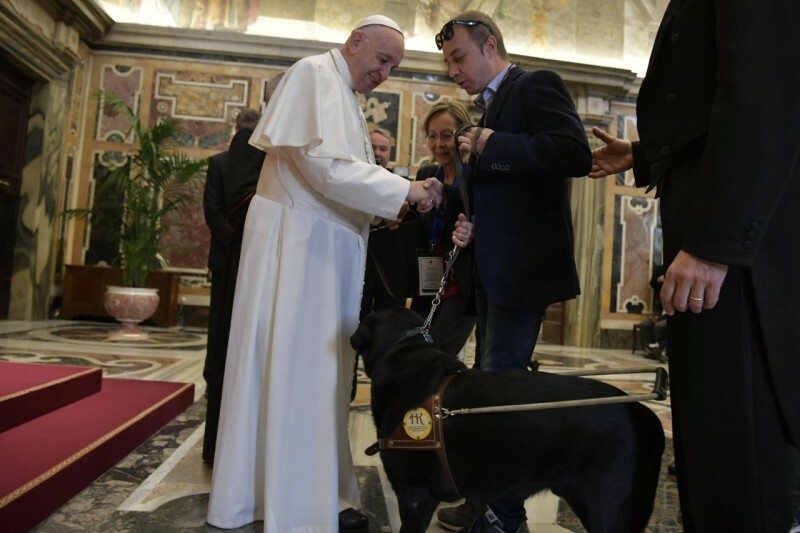 The first is the sharing between blind and blind, as a fruit of solidarity in reciprocity, in view of a fruitful process of ecclesial and social inclusion. The second is the choice of the poor, a choice which, in various ways and forms, is proper to the whole Church. So cooperate in making a poor Church grow for the poor, experiencing that they have much to teach us, and that putting them at the center is a privileged way of evangelization. Your concrete commitment to help and support the poor makes you protagonists in the work of evangelization that the Church is doing at the pace of the last. In fact, "we are called to discover Christ in them, to lend our voices to them in their causes, but also to be their friends, to listen to them, to understand them, to welcome them and to welcome the mysterious wisdom that God wants to communicate to us through they "(Apostolic Exhortation Evangelii Gaudium, 198). Especially after Vatican Council II, your Movement has generously opened itself to the commitment of human promotion both in Italy and in the poorest countries. The first sector of activity that quickly became a reality was that of solidarity with the blind of the poorest countries. It took shape within the association, to the point of involving all your groups and different Italian dioceses. I congratulate you on the work carried out in these fifty years of cooperation with hundreds of missionaries and practitioners in the fields of health, education and social integration. And this missionary work of practical proximity to the poorest brothers has stimulated and made you grow in your attention even to the last and most distant in the national territory, in favor of blind elderly people, blind students, people with multiple disabilities, parents and children who live the problem of blindness. All this helps to spread the culture of hospitality, helping many people and families. Although small in the face of the enormity of the problems of the world, we are strong in the love of God and all "called to care for the fragility of the people and the world in which we live" (Apostolic Exhortation Evangelii Gaudium, 216). Dear friends, continue your journey with constant confidence, aware of the fact that the future of humanity lies in sharing and friendship above all with the poorest and most abandoned. Thank you for your testimony. And please, remember to pray for me. Thank you.